The Polar Express is the Christmas heartwarming movie about the power of faith and hope that resonates across cultures and generations because the marvelous movie of the Chris Van Allsburg Christmas masterpiece about one of the impressive enduring mysteries of the universe: Santa Claus! Mystery trumps reason and brings true happiness to the heart! The Polar Express shares with moral themes about the beauty of being generous to others, the power of faith, respect for courage and leadership, and the value of friendship! I watch this movie a couple times every Christmas. The animation, music and story are wonderfully great. A true classic, one of the best, thank-you Tom Hanks. Masterpiece in motion capture computer animated film making! This is a classic I have seen several times during the Christmas holidays. Tom Hanks is exceptional playing five different animated roles of the conductor, Santa Claus, the father, the ghost drifter, and the narrator. The computer animation and music are first rate. The storyline is original and captivating. You can connect with the characters in this film. You actually feel as you are on this fantastic and magical train ride to the North Pole. Brilliant script from start to finish. Phenomenal storytelling! excellent... " See is believing"
I had this DVD bought for me from my mom & dad and I watch it most nights. My favorite bit is when Billy & the girl singing. incredible special effects and animation. looks real. a bit slow though. nice plot however. Amazing !!!!!!!!!!!!!!!!! One of the Best Films Ever! i did not like this movie at all. it was a cheesy and totally unrealistic storyline, even if it was just a dream (not really). The only part i enjoyed was when the train was flying ovet the ice. MOVE OVER CELEBS THE POLAR EXPRESS IS COMIN THROUGH!!!!!!!!! Bought the DVD a year after the movie was released. I`m 70 and love trains. Lots of hype but OK graphics and a decent kid`s story. It wasn`t a box office smash that was expected by the studio but everyone tried awful hard and it will be a classic for years to come. I expect to see it on TV soon as a blockbuster Sunday night movie for kids, along with "A Christmas Carol", "Miracle on 42nd Street" and "Its a Wonderful Life". Briefly, a "Boy-Kid" movie for adults and good for kids too. Kind of scary for the "under 6" though. Highly recommended for the 8-10 set. This movie was really good. It`s a good family Christmas movie. Tom Hanks is a good actor. I liked it so much I saw it twice in theatres. The second time was The Polar Express: An Imax Experience. This was one of the most magical movies I have ever seen. It is particularly stunning on an Imax screen if you ever get an oppurtunity. It is a "feel good moview" similar to "It`s a wonderful life" I highly recommend watching or purchasing this movie. excellent i loved it so did my mother. Awesome...great story and fantastic animation. The soundtrack was great as well. The story was easily understood by my preschooler. A year after seeing it he still talks about it and enjoys listening to the music. It`s sure to bcome a classic! Amazing! Awesome animation and even though it`s a Christmas movie, you can enjoy it all year round! I liked the polar express because when i saw it 3-d everything seemed like it was going to hit me. It`s a good movie as Christmas movies goes, but I wouldn`t say it`s spectacular or magnificent. 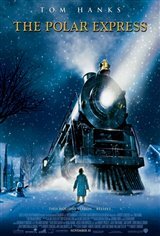 i thought that the movie The Polar Express was a very good movie.and it looks like you are actualy on the polar so i think that the avrage rating should be ***** five stars. it is a wonderful film it made me luv christmas more then i already did. i saw it with my school and we all luved it!!! the best christmas film eva! Truley a wonderful movie. If you did not like it then you were not watching it. Awesome movie!!! - I kept forgeting it was animated. Tom rocks even under the computer generated images that he portrayed. I really enjoyed watching "The Polar Express". We may have been better off watching the movie before Christmas, but the holiday film made me feel really good inside. It`s not very much like the book, but I like the movie better because it fills in more detail. I really think you should see it, but wait until next Christmas. this movie was one of the best tom hanks movies i`ve seen. The graphics are very well done and it`s a great christmas movie. I give it a 5+. I was sucked in by Hollywood hype and ended up paying a lot at an IMAX to see a dumb kids movie. I don`t know what age child would like it. There were kids crying when I saw it. Those waxy-looking characters were awful and wouldv`e looked better if THEY wore the 3-D glasses. I feel like Hollywood is playing a version of the Emperor`s New Clothes in that we`re all supposed to love this just because some techno-geeks created something "different". Sorry, it`s a bust. And I agree with others that said it was boring. Way too long. I went to go see this movie with my school and I thought that this movie was very good. The characters looked really like who was playing there part (The Voice). Very good movie and good for all ages. Good Job!! I enjoyed The Polar Express a lot! I am sure the Polar will become a classic Christmas movie. Enjoyed thoroughly with my 7 year old daughter. Amazing! We saw it on the Imax screen and you felt like you were right there with the actors! Snowflakes landing on your nose, so close that you could almost touch them! Incredible technology! A must see for all ages. Great, a little scarry at times for my 4 1/4 yr old but a great experience for us together. Will think back to the time we spent watching it for years to come. The excitement in his eyes and the wonder felt by both big and lttle who love trains and christmas even more. An INCREDIBLE Christmas movie! The combination of amazing graphics and a loving story for the whole family make this, in my opinion the BEST film of the year by far. Definitely deserving of a number of academy awards. Make some time over the holidays to enjoy this film with your family. Merry Christmas! I thought The Polar Express combined amazing computer animation and a wonderful story to keep us all spellbound. Adults and kids will enjoy this movie as it touches the kid in all of us as a young boy struggles to keep the magic of Christmas alive in his heart. The animation was absolutely incredible and I felt like I went to the North Pole to see Santa right along with the kids. Thoroughly enjoyable for both young and old! This movie was good.. it was WAAAAY better than the book,... they expanded it more and it was better since the book was a picture book. I went with my class so it was a surprise that i didnt talk alot with my friends during the movie..
i really liked the movie it was exactly like the book and it was an intreguing story line and i really liked the actors you used it even made the movie alot better it is a tough job to act and they did amazing. I`ve read the book for many years. As a child I always skipped to the part about the North POle. The movie captured the embiance set by Chris VanAllsburg very well.